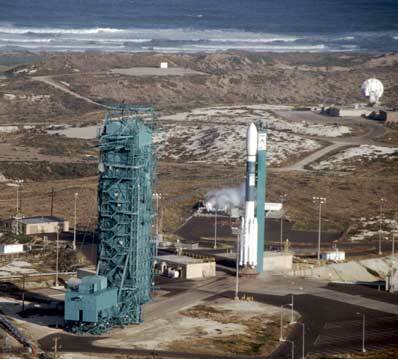 Space Launch Complex 2 (SLC-2) at Vandenberg Air Force Base (VAFB), Calif., is the home of west coast launch operations for the Delta 2 expendable launch vehicle. From SLC-2, Boeing launches satellite payloads into polar and near-polar orbits. The first Delta launch from VAFB occurred Oct. 2, 1966, when Boeing launched the Environmental Science Services Administration's ESSA 3 satellite for NASA. After a six-year hiatus, Boeing resumed launch activities at SLC-2 on Nov. 3, 1995 with a successful Delta 2 launch for NASA of the Canadian RADARSAT scientific Earth observation satellite. In addition to NASA and Department of Defense payloads, Boeing has launched the majority of the Iridium global telecommunications network satellites, using 11 Delta 2 rockets.